Composite photograph of the Star-Spangled Banner, 2004. September 1814, as Francis Scott Key viewed through clearing smoke the American flag flying magnificently after a more than 24-hour battle of British attack on Fort McHenry, (Baltimore). Mr. Key was inspired to write a poem and quickly scribbled the words to all four verses on the back of a letter. The poem would later be set to music and in 1931 Congress adopted it as our official national anthem. 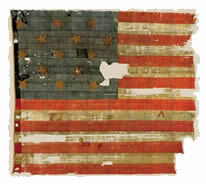 The flag that flew that fateful day is now in the Smithsonian Institution. Their blood has washed out their foul footstep’s pollution.